The official ground breaking ceremony for the Major Road Infrastructure works scheme at Junction 36 took place today at the site compound. 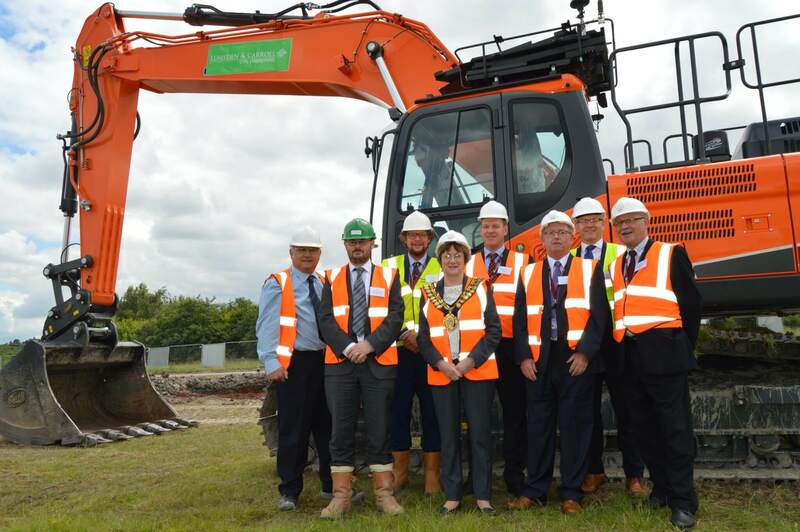 Attendees included the Mayor of Barnsley, Cllr Linda Burgess, Cllr Roy Miller, Esh Construction’s Regional Managing Director Andy Gawthorpe and representatives from Highways England. Funded by the Sheffield City Region Investment fund, the scheme will provide a significant contribution to Barnsley and the Sheffield City Region and support growth ambitions for the borough, supplemented by significant private sector investment which will unlock future housing and employment land. The works are not only set to deliver a major improvement to a road network that currently has severe congestion issues but will open the gateway to future opportunities and support plans to grow the local economy and stimulate the growth of more and better jobs and homes and improve the local economy. The project is due for completion within a 78 week timeframe. Regular updates on the progress of the works will be shared via the Barnsley Council website, Facebook and Twitter. Pictured are (l-r) Cllr Roy Miller, David Pratt, David Shepherd, Mayor of Barnsley Cllr Linda Burgess, Matthew Gladstone, Cllr Jim Andrews, Paul Castle and Cllr Robin Franklin.